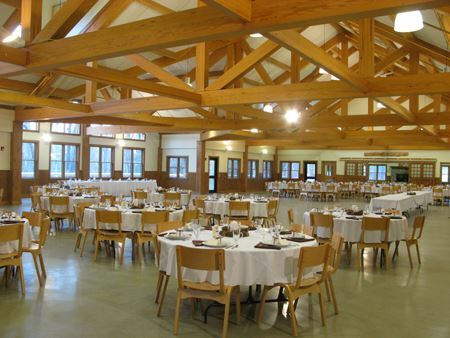 Our 40th Annual Gathering will be held on Sept. 6 - 8, 2019, at the Berkshire Outdoor Center in Becket, MA. See below for some of the highlights from our 38th Annual National Gathering over Memorial Day Weekend 2017, as well as some info on 2018. Stay tuned - this page will be updated soon. Get Ready to Have Fun, Meet Women From Across All Our Regions, and Celebrate Women Outdoors! This photo is from one of our Gatherings that have taken place on Memorial Day weekends for years. This year, we're having the Gathering in the Berkshires, and we're moving it to the fall. We're very excited about the change and hope you can make it! What's not changing: women from across the country come together for the Women Outdoors National Gathering: three wonderful days of fun and adventure. Whether you're a hiker or biker, kayaker or swimmer, birder or star gazer, painter or poet, writer or reader, the Women Outdoors Gathering has something for almost everyone. We'll once again have kayaking and canoeing, but this year, don't bring your own boat. We'll be using the Berkshire Outdoor Center's boats. Other boats are prohibited, given attempts to protect their lake from invasive species. You can, however, bring your own PFD and/or paddle. No worries if you don't have them: the BOC does. Stay tuned for early registration in Bonna's paddling workshops: we're opening this up first to Women Outdoors members before the broader group of participants at the Women's Wellness Weekend. Sign up early! Berkshire Outdoor Center is home to the largest, most comprehensive educational Challenge Course facility in the Northeastern United States, with over 60 combined low and high elements. We're working now with BOC (Berkshire Outdoor Center) on the agenda, but we can tell you that their past weekends have included an extremely rich, diverse set of activities and workshops: everything from night hikes to cheesemaking. Women Outdoors is going to enrich their already jam-packed agenda with well-loved activities from past Gatherings: a long hike (on the Appalachian Trail), kayaking instruction from our beloved Bonna Wieler, and leadership training, to mention a few. Stay tuned: you're going to have a tough time choosing what activities to take part in, but be warned: youre advised to sign up early for water activities on Becket Lake: Women Outdoors members get first crack at available slots! We'll have one less night than at past Memorial Day Gatherings, but plans right now have us still having a dance and the national Women Outdoors all-member meeting. Plus, of course, we'll still have the always entertaining Coffee House Review – a talent show of Women Outdoors members that we're also opening up to non-WO members from the Women's Wellness Weekend. Be prepared to make new friends! The Berkshire Outdoor Center staff run the Chimney Corners campus in Becket, Massachusetts. Located on 1,350 acres of beautiful conservation lands in the Berkshire Hills of western Massachusetts, this pristine environment makes for a rustic, natural, secluded experience. An extended network of marked hiking trails criss-crosses the property, providing access to guided nature hikes in the serenity of the natural Berkshires. On over 90 acres, Rudd Pond is an exceptional example of a typical New England pond. Additionally, there's Ice Pond, near the Brewster House (built in 1786 and listed on the National Register of Historic Places), and Smith Pond - a long, narrow pond at the Chimney Corners campus where we'll be staying. BOC owns the land around all three of these ponds, making our stay quite private. No motorized boats are used, providing a peaceful, tranquil experience. Additionally, several brooks run through the property, some of which have been dammed by American Beavers. These beaver meadows cover many acres. Wetlands created by beavers, as well as other natural vernal and year-round wetlands, are the highlight of the area's backcountry. The highlight of the waterways, however, is the Peat Bog. Covering about 1.5 acres, the bog is pristine. You'll be able to see species including Pitcher Plants: carnivorous plants that live specifically in that type of habitat. Recent mammal sightings include beaver, porcupine, otter, fisher, black bear, moose, flying squirrel, red fox, coyote and much more. Check out this page for a list of other recent sitings, including birds, fish, reptiles and amphibians. Check out the Chimney Corners campus accommodation descriptions. The BOC dining staff serve three meals a day in their fabulous dining hall. Each meal is served hot, is nutritionally balanced and includes a vegetarian option. Special arrangements must be made with the Food Service Department for guests with allergies who require special meals. BOC tries to accommodate guests with food allergies & food sensitivities to the best of its abilities. They always accommodate guests with life-threatening allergies to the eight major allergenic foods and will try their best to accommodate food sensitivities. However, guests with these sensitivities must understand that this is not always possible; All BCCYMCA guests & staff have the opportunity to complete a food allergy questionnaire, to be completed during registration. Registration for 2019 is NOT yet available.